Hwawei's IDEOS smartphone is making waves in Kenya. Where else will Android phones leave their mark? 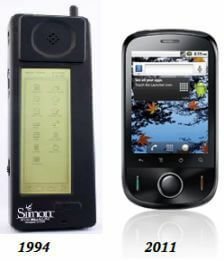 IBM Simon (left) and Huawei IDEOS (right). Smartphones are getting more powerful, and now they're going all over the world. Let’s compare the IDEOS to more familiar smartphones so you can fathom the $80 price tag. A cursory search of BestBuy.com reveals the gamut of devices from Apple, Motorola, and Blackberry. While IDEOS really doesn’t sport any deal-breaking technical disadvantages (see table), the RAM is half that of the big boys. Also, IDEOS users have been lamenting about the device’s fleeting battery life on tech forums. An incessant need for recharging could present problems for IDEOS users in remote areas, where hunts for a power outlet may yield disappointing results. In fact, to address this concern, Safaricom had to post a “how-to” on reducing power usage. Despite these hiccups, the functionality is still there, and at end of the day, it’s an Android phone with 300,000+ apps. Besides, what’s important isn’t the phone’s tech specs, it’s the affordability. Now that hundreds of thousands of Kenyans have jumped on the Android bandwagon, it’s clear that affordability goes a long way. However, the IDEOS’s stellar sales performance in a developing nation hints at a larger phenomenon – the international competitive edge of Android-capable, low-end smartphones. This is facilitated by two key advantages: diversity in phone manufacturers and region-specific applications, both catalyzed by Android’s open source philosophy. Unlike Apple and Blackberry, everyone and their grandmother can legitimately build and sell an Android phone, as long as they have the proper know-how and paperwork, of course. This widens the playing field, and manufacturers that target a wide range of consumers, from the Japanese businessman to the Ugandan farmer, can step up to the plate. This includes Huawei and other Chinese tech firms that have been targeting African markets. In light of Android’s international success, I bet Apple is chomping at the bit. But could they ever realistically overcome Android in developing markets? While Apple is nudging into the low-cost realm with its own price accessible smartphone, it will likely cost around $350, a far cry from IDEOS. I’d like to see how Apple would react if a Chinese firm started selling their own inexpensive version of the iPhone. But what about the “little guys”? Although Windows and Nokia encourage the adoption of their operating systems, frankly, these OS’s have either fallen from grace or have failed to get off the ground. Among these players, it seems Android is best equipped for a global presence, whereas Apple and the others probably won’t fall far from the high-end tree unless they re-calibrate their strategies. There’s enormous potential for low-end phones in developing markets, and Android is taking charge. 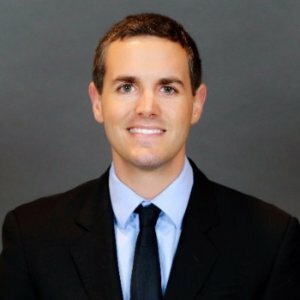 So what does open source mean for developers? More flexibility. If app-gurus are free to program without rigid, Apple-like standardization, then they’re better able to tailor the Android to the needs of their communities. The Android app business is a tough one, but keeping in mind that the smartphone is Africa’s laptop killer, it’s also one of the most exciting platforms for the continent’s developers. Case in point. An entrepreneurial conference in Nairobi called Pivot25 showcased some of the most innovative Android apps in East Africa. 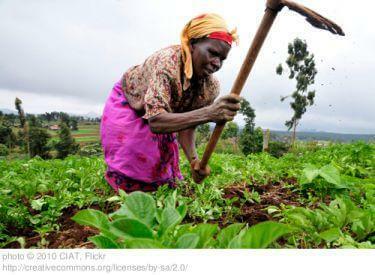 Among these include M-Farm, an app that allows farmers to broadcast product prices and locations to the world via SMS. Another agri-app developed by Makerere University helps diagnose and track the spread of crop diseases via crowdsourcing. In a nation where agriculture accounts for nearly a quarter of GDP, apps like these could prove invaluable in maximizing harvests and facilitating the spread of precision farming. Smartphones could enhance practices in agriculture, a crucial sector of many developing economies. While agri-apps are well-suited for the developing economies, the winner of Pivot25 was Medkenya. It’s the functional equivalent to WebMD in that it puts a library of health information at the user’s fingertips and performs other helpful tasks like guiding the ill to hospitals. 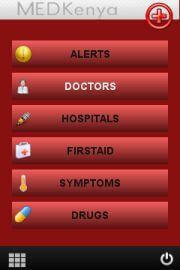 However, I have a hunch that this is just the beginning of healthcare-related apps in Africa. We’ve seen smartphones adopt all kinds of medical technology, from digital stethoscopes to cancer diagnosis, and I’m hopeful that we’ll see similarly stunning med-tech reach even the remotest areas one day. An app that tracks mosquito outbreaks or a smartphone with an HIV-testing peripheral would work wonders to address persisting healthcare challenges of the developing world. Who knows? Maybe one day they’ll be able to carry a doctor around in their pocket. From agriculture to healthcare, from disaster response to business, the smartphone is quickly morphing into an indispensable tool of the information age. They’re much more than neat gizmos that help American suburbanites pay for their coffee. This sentiment was best captured by Dr. Bitange Ndemo, Kenya’s Minister of Information and Communication, after IDEOS’s debut. In the beginning of the 21st century, the mobile telephone was the reserve of an elite few and the gadget’s sole purpose was to make phone calls and send text messages. Today, all this has changed and the mobile phone is no longer a luxury but a necessity. By morphing and adopting into various aspects of our lives, the mobile phone has gone beyond its original purpose of phone calls and text messages and it now serves as a bank, a computer a radio and a television set among other things. In a nutshell, it has penetrated every aspect of our lives. The smartphone is the exemplar of a truly liberating device, and thanks to Android and Huawei, it has the potential to reach virtually untapped markets. Now that the same operating system enjoyed by the techies of wealthy countries is more accessible to citizens of developing nations, “the people’s smartphone” could uplift small businesses, farmers, and the sick in ways we can’t even imagine. I’m not saying low-end Androids will solve all the world’s problems, but I believe that technology, be it stem cells or mobile devices, has the inherent capacity to ease humanity’s burdens. As we ride the price-performance curve to the asymptotic minimum, I long for the day that anyone can access Android-like technology for pennies. That day may never arrive, but the $80 IDEOS shows that we’re moving in the right direction.